This urban development is the ultimate luxury condo experience. 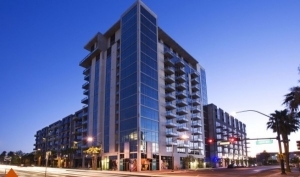 Offering studious, one and two bedrooms and is located in the thriving downtown Arts District of Las Vegas. Right between the Fremont Street Experience and steps away from the pedestrian mall with a vast array of live entertainment and nightlife with stunning views of the city, as well as some of the city's most iconic hotspots. The Juhl is known for its exclusive amenities with an inclusive atmosphere with the ultimate community living. You will live a ravish life style as you have drinks at the rooftop terrace bar and engage at one of the many regular events that the resident Lifestyle Director plans - the entire campus works to foster to build relationships between members of this urban community. This is Las Vegas condo living at its finest.